There are not many firearms that are as iconic as the shotgun. They are powerful firearms that can serve a multitude of purposes, especially when paired with one of the best shotgun scopes. They are good for flying game, small and medium sized game, and for personal defense. 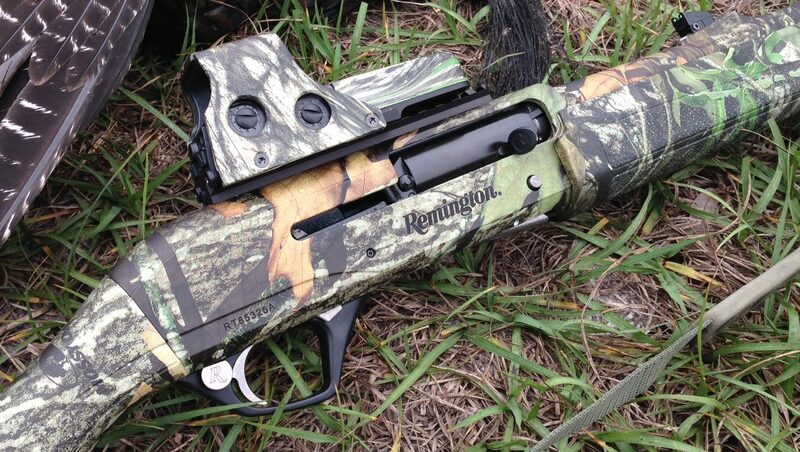 When most people think of the shotgun, they imagine the pump version that their grandparents used on hunting trips. Shotguns have evolved quite a bit. Even though the pump-action shotgun is still widely used, semi-auto shotguns have become staples in many households. As the shotgun has evolved as a firearm, the ammunition that it uses has evolved as well. The standard ammo of birdshot, buckshot, and slug have become more lethal and widely available. With ammunition and shotguns becoming more modern, it is time to add the best shotgun optics to get the most out of modern technology. Ranges for modern ammunition have extended beyond what can be seen through the older open sights of a shotgun. Scopes have been used for decades and this article will seek to explore the best shotgun scopes for your shotgun. You may have a shotgun passed down from generation to generation or a brand-new shotgun. Most new shotguns come with a receiver ready to receive scope rings, but older shotguns may need to have them added by a competent gunsmith. Whatever you have to do to get a scope added to your shotgun, do it. 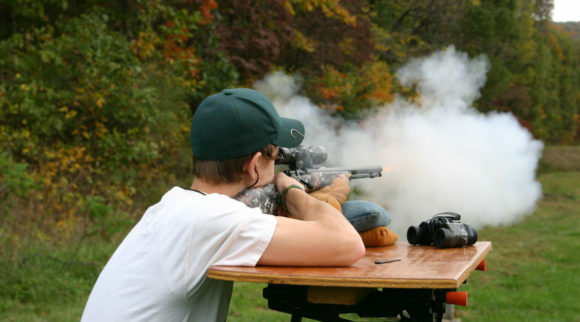 Adding a scope to your shotgun will make you a more effective and ethical hunter. The first scope on our best shotgun scope list is the Nikon ProStaff Shotgun Hunter BDC 200. Nikon began manufacturing in Japan. They originally specialized in making lenses for cameras, binoculars, and microscopes. As WWII began, Nikon retooled their machines to manufacture binoculars, bomb sights, and periscopes. With a rich history of making military grade products, it is no surprise that they are able to make great scopes for the modern-day hunter. This scope has an adjustable magnification from 2x power up to 7x power. This scope features a 32-mm objective diameter. It has a fully multi-coated optical system that provides optimum light transmission and brightness. 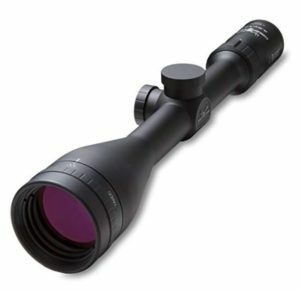 This scope can be used for an early morning hunt or a hunt just before sunset. Nikon has added a quick focus eyepiece to this scope that allows the shooter to instantly bring the reticle in focus as you look through the scope. The ProStaff Shotgun Hunter has a field of view at 75 yards that ranges from 9.5 feet at its lowest magnification and 33.4 feet at its highest magnification. With its lower magnification range the Shotgun Hunter can offer you safe and effective eye relief of 3.8 inches. This is long enough for you to feel safe to shoot even the heaviest recoiling shotgun loads. This scope’s 1-inch diameter tube is different from any other scope on this list. It is constructed using polymer, not aluminum like the others on this list. It is just as capable to stand up to heavy loads as aluminum tubes. Along with being strong, it is nitrogen purged and o-ring sealed. These processes make it water and fog proof. It has an overall length of 11.5 inches and weighs just under a pound at 13.9 ounces. This scope will not make your shotgun feel heavy as you stalk through the woods towards your game of choice. The ProStaff Shotgun Hunter features Nikon’s zero-reset turrets. These turrets are capped to protect any adjustments you make. With the zero-reset turrets you sight your shotgun in as usual at the range. When you are zeroed, you lift the spring-loaded adjustment knob and rotate it to your zero and let go of the knob. When you find your target in the field, you simply dial in the range on the turrets and fire. Nikon has made hitting your target just a little bit easier for you. The turrets are adjusted ¼ MOA at a time. When adjusting these turrets there is a positive sounding click meaning they will stay in place even under the heaviest of recoil. Along with the turrets making your shooting a little easier, Nikon has added the BDC 200 reticle to this scope. The BDC 200 reticle was designed for aerodynamic polymer-tipped slugs with muzzle velocities of 1900-2000 feet per second. This trajectory-compensating reticle features unique and easy-to-use “ballistic circles”. These circles provide instant aiming points that will help you take the guesswork out of holdover at long ranges. The Nikon ProStaff Shotgun Hunter is backed by Nikon’s lifetime repair or replace warranty. Nikon’s reputation of quality and innovation paired with this warranty, make this scope a must buy for beginners or even the most experienced hunters. The next scope on the list of the best shotgun optics is made by yet another company with a strong reputation for quality scopes. Bushnell has been manufacturing high quality optics for more than 65 years. As a company that started out with a mission to build high-performance optics, they definitely deserve a spot on the best shotgun scope list. Their constant innovation and exploration in to new technology makes them one of the best-known optic manufacturers in the world. The Bushnell Trophy Shotgun Scope features a fast focus eyepiece much like the one found on the Nikon ProStaff Shotgun Hunter. A unique feature of the Bushnell scope is the ability to adjust the parallax. There is a knob on the side of the scope that allows you to adjust and align the focal plane of the reticle without taking your eyes of off the target. This will allow you to have a clear visual of your reticle and your target at the same time. Having a clear visual of your target is made even easier with Bushnell’s fully multi-coated lenses. Multi-coated lenses feature multiple layers of anti-reflective coating that helps deliver bright and high-contrast images. Seeing your target has never been easier than it is with this scope. The Bushnell Trophy Shotgun has an adjustable magnification, from 3x power up to 9x power. Plus, it features a large 40-mm objective lens. This scope has a field of view at 100 yards; that is slightly better than the Nikon ProStaff Shotgun Hunter. At the minimum magnification, the field of view is 38 feet. While at maximum magnification, the field of view is 13 feet. 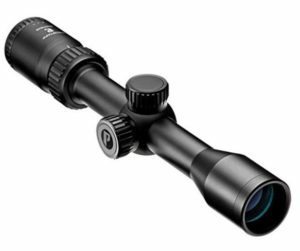 This scope features a 1-inch tube that is constructed out of one piece of aluminum. The Trophy Shotgun scope is nitrogen purged and o-ring sealed. It is waterproof, fog proof, and shock proof. It weighs 14.1 oz. and has an overall length of 12 inches. According to Bushnell, their Trophy Shotgun scope has an eye relief distance of up to 102 inches. This is by far the most eye relief of any scope on this list. The Trophy Shotgun scope features capped turrets that can be adjusted by ¼ MOA per click. These turrets do not feature the same zero-reset as the Nikon scope. The adjustment clicks are quite audible so that you know when and how many adjustments you have completed. Acquiring and hitting your target is made a little easier with the large diameter lens and Bushnell’s DOA 200 shotgun reticle. This reticle features several horizontal lines that represent ranges out to 200 yards. This is perfect for any shotgun as their effective range does not extend too far beyond that range. Much like Nikon’s ballistic circles, these lines allow for consistent aiming points at several different ranges. With its sturdy all-aluminum construction and proprietary reticle, the Bushnell Trophy Shotgun scope is another quality scope for the Bushnell line. It boasts an extremely long eye relief and very clear glass. It is backed by Bushnell’s Ironclad Warranty which will repair or replace your scope any time during your life. The warranty and quality of this scope make it one of the best shotgun optics on the market. You cannot go wrong when purchasing a Bushnell product. The next scope on this list is made by a company that is relatively new to scope manufacturing, at least when compared to Nikon and Bushnell. The third scope on the best shotgun scope list is made by Burris. Burris was founded by Don Burris after he left the Redfield company. He believed he could make a better scope than those made by that company. Burris started out making scope accessories but soon began manufacturing scopes full time in 1975. Burris is able to make quality scopes because they blend tested designs with innovative ideas to make reliable products. The Burris Drop Tine scope features a durable, integrated-eyepiece that has a no-slip grip for easy adjustment. Being able to adjust the eyepiece in any weather conditions is an important key to ethical shot placement. You do not want to miss your target due to it being out of focus. Like the Bushnell scope, the Drop Tine scope has a 40-mm objective lens that allows it to gather lots of light. Burris has spent a lot of their time perfecting the glass in their scopes. The Drop Tine features high-grade optical glass, which provides excellent brightness, clarity, and lasting durability. The lenses are precision ground and larger than those of other scopes in its class. Burris uses their trademarked Hi-Lume multicoating to aid in low-light performance and glare reduction. Lenses in a scope are very important and Burris understands that, their glass is some of the best on the market. The Burris Drop Tine scope is adjustable from 3x power up to 9x power. It has a field of view of 33 feet at 3x power, and 13 feet at 9x power. This field of view is not the most, nor least, of any scope on this list. That is why this scope sits third on our list of five best shotgun scopes. The scope itself is constructed out of one piece of aluminum. Like the previous scopes, it is nitrogen purged and o-ring sealed. It is water and fog proof. The Drop Tine is 12.2 inches in length and weighs 13 ounces. This is not the most compact nor lightest scope on the list, hence its ranking. 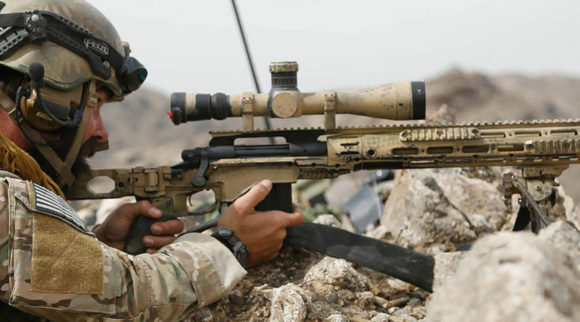 It is still a quality scope and can help you hit your target every time. Plus, it features a generous eye relief that ranges from 3.1 to 3.8 inches. This extended eye relief will allow you to shoot anything from birdshot to heavy slugs without worrying about an injury. 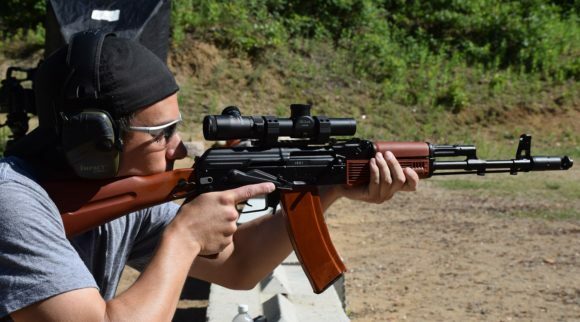 The Drop Tine features capped turrets, just like the other scopes on this list. The gears that you turn to adjust the scope are steel. Steel gears result in a positive click with each adjustment. They can also be trusted to hold those adjustments even under some of the heaviest recoil. This scope has a Burris Ballistic Plex reticle. This reticle is specifically calibrated for sabot shotgun loads. It is a simple reticle that keeps you focused on your target. 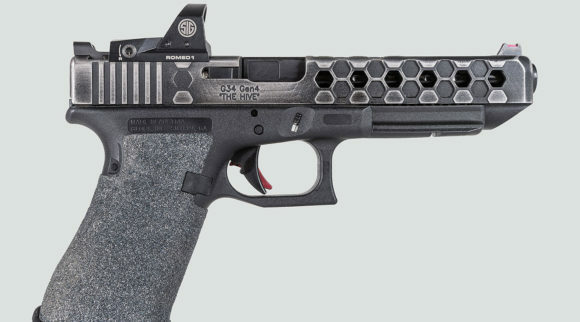 It features hash marks that designate ranges so that you can consistently make shots without having to reference any external documents that you may have written at the range. As stated earlier, there is nothing that sets the Burris Drop Tine apart from the Nikon and Bushnell scope. That is why it is third in the rankings for best shotgun optic. It lacks some of the features of the previous scopes, but does contain innovative glass lenses. Although it is not the number one scope, it is still a reliable option and one of the best shotgun scopes out there. It has clear glass, is durable, and features an easy to use reticle. It is backed by the Burris Forever Warranty that will replace the scope if it is damaged or defective, no questions asked. The fourth scope on the list for best shotgun scopes is made by a company known for its scope rings. Weaver has an amazing history of producing scopes. The company was founded in 1930 and its first products were riflescopes that competed with more expensive scopes imported from Germany. Like Nikon, Weaver produced rifle scopes during WWII and transitioned to the civilian market after the war concluded. By the 1960s, Weaver was manufacturing half of the scopes used in the United States. It is no wonder Weaver can still produce quality scopes. The Weaver Kaspa Turkey Obsession features the lowest power setting of any scope on the list of best shotgun scopes. In addition, it features the smallest objective lens of any scope on the list. Although the objective lens is only 24 mm, it is still clear. Weaver’s lenses are fully multi-coated to allow for increased clarity and light transmission. Thanks to the coated lenses, images in your scope should be vivid and unmistakable. The Turkey Obsession can be adjusted from 1x power up to 4x power. Being that this scope has lower magnification power, it has the best field of view at 100 yards than any other scope on this list. At 1x power, the field of view is 109 feet, and at 4x power the field of view is 27 feet. 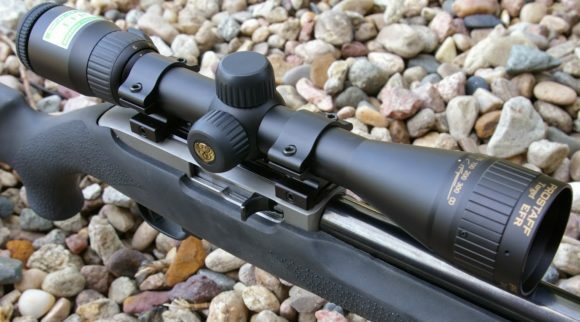 This Weaver scope is the only scope on this list that has a 30-mm tube. Although that is different than any scope on this list, it is quite common among scopes. You should not have any trouble finding rings to work well with this scope. The tube is nitrogen purged and is waterproof and fog proof. 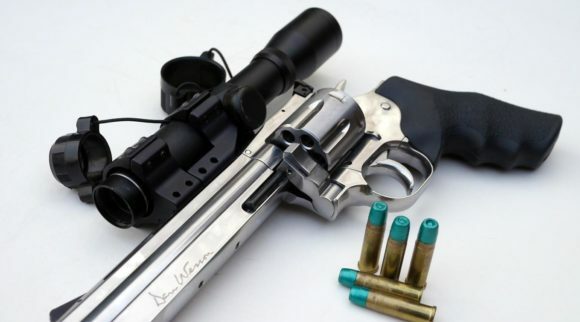 This scope is one of the lightest and it is the shortest scope on this list. It is only 10.5 inches in length and weighs 10.58 ounces. With a generous eye relief of 3.54 inches to 4 inches, this scope can be placed comfortably anywhere on your shotgun. The Weaver Kaspa Turkey Obsession features capped turrets like all of the other scopes but has slightly different adjustments. This scope is adjusted ½” at 100 yards with each click. This is a little different than the other scopes that adjust ¼ MOA. The one thing that sets the Weaver scope apart from the other scopes on this list is the reticle selection. 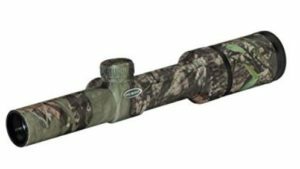 When you purchase this scope, you can select between a Vertical Turkey Zone, Slug/Muzzleloader, or Dual-X reticle. The Vertical Turkey Zone reticle allows you to line up the crosshairs with the kill zone of a turkey. 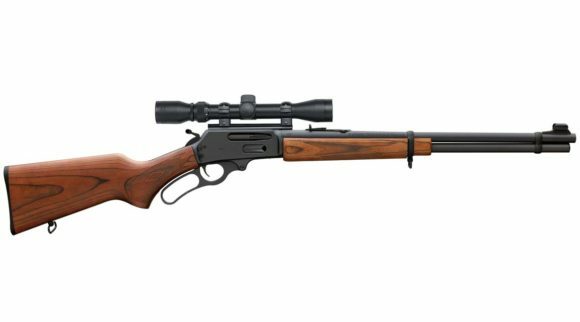 The Slug/Muzzleloader reticle is designed specifically for the hunter using slugs in their shotgun and the Dual-X is a plain reticle without any range marking hash marks. This scope is backed by Weaver’s limited lifetime warranty. It may not be the most powerful scope on this list, but it is extremely versatile. The clear glass and quick target acquisition of a 1x power scope allow you to get on and stay on target. 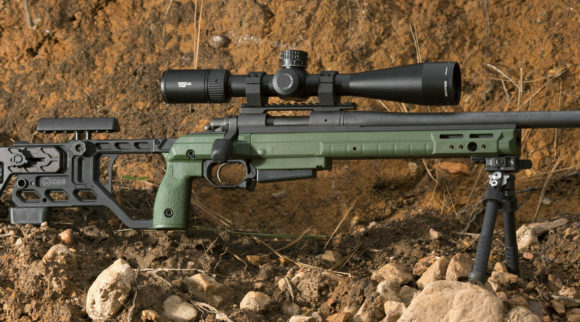 Weaver makes a quality scope for hunting that will not disappoint you. The last scope on the list of best shotgun optics is the only fixed power scope on our list. Simmons was established in 1983 making them the youngest existing company producing the best shotgun scopes featured on this list. Simmons has been combining innovation with durability since they began manufacturing scopes. Not only are their scopes a quality product, they are also a low-cost option for every hunter. The Simmons ProHunter Shotgun is their attempt to develop a quality shotgun scope. The Simmons ProHunter Shotgun makes the list of the best shotgun scopes for several reasons. 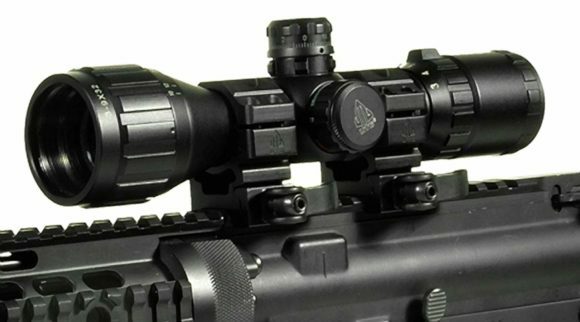 This scope features a quick target acquisition eyepiece that allows you to get on target quickly. 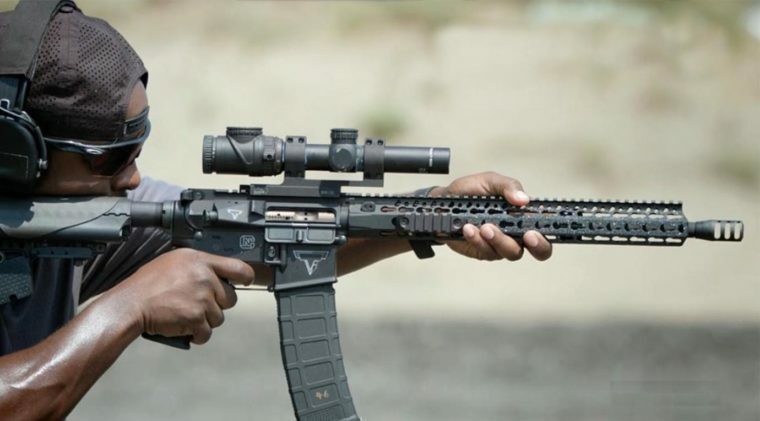 There is no confusion as to what your target is when looking through the clear glass of this optic. The ProHunter Shotgun has a 32-mm objective with fully multi-coated lenses. 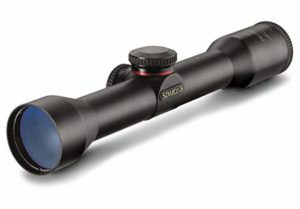 Simmons uses high-quality glass that provides the brightest and sharpest image in its class of scopes. The field of view for this scope is 23.6 feet at 100 yards. That field of view is more than enough to help identify your target and anything around it. The scope is constructed entirely out of aluminum and has a 1-inch tube. The tube is nitrogen purged and o-ring sealed. 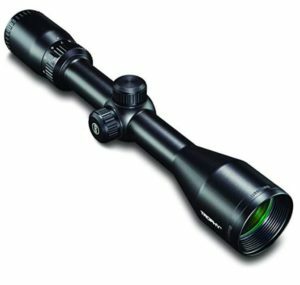 Much like the other scopes on this list, it is waterproof, fog proof, and recoil proof for ultimate reliability. The ProHunter Shotgun has an eye of 4 inches, which gives it a lead on some of these other scopes. The scope has an overall length of 9.5 inches and weighs only 8.6 ounces. Like every other scope on this list, the ProHunter Shotgun features capped turrets to help protect your adjustments while moving through dense foliage. 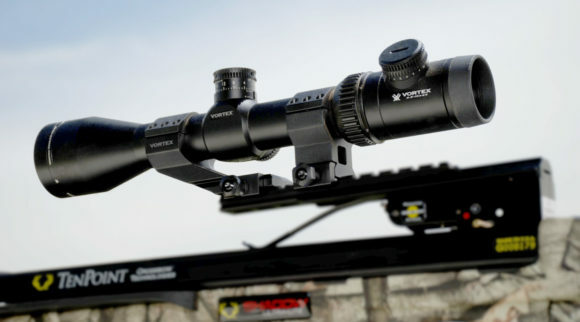 Simmons has equipped this scope with their trademarked TrueZero windage and elevation system. This makes quick adjustments for range in the field very easy. The scope can be adjusted in ½ MOA increments. The ProHunter Shotgun features the ProDiamond reticle. This reticle allows the shooter to align hashmarks that have designated ranges to their target. Consistent shot placement is possible after you zero your scope to your shotgun. The Simmons ProHunter Shotgun is backed by Simmons Lifetime Warranty. Fixed power is the only thing keeping this scope in fifth place on our list of the best shotgun optics. It has many features that are desirable in any shotgun scope. Simmons has designed a reliable and quality product that can be used for years to come. Shotguns are a blast to shoot. Make sure you have your shotgun equipped with the best shotgun scope that you can afford. The five listed in this article are fantastic additions to any shotgun and will serve the hunter faithfully for years to come. When shopping for the best shotgun optic, remember, what works best for you is the only thing that matters when it comes to finding the best shotgun optic. 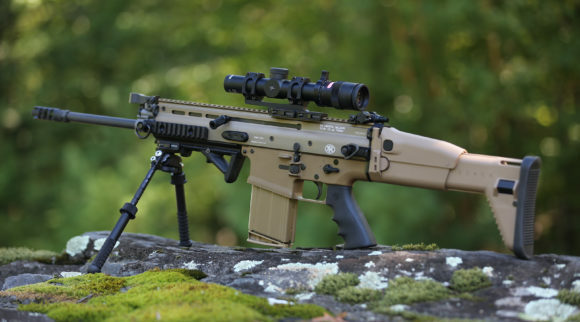 You will be the one zeroing it at the range and using it on your hunts. Don’t settle for a shotgun scope that is not the best for you. Good luck out there on your shotgun hunt, be safe!